Sitting at the base of the Rocky Mountains, Colorado Springs plays host to breathtaking mountain vistas and stunning landscapes that served as the lyrical inspiration for “America the Beautiful.” One of the most sought-after neighborhoods in the area is Briargate, known for its favorable location near The Promenade Shops at Briargate and Chapel Hills Mall. 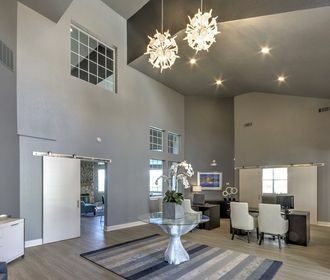 Here, you will find Commons at Briargate, a community that epitomizes the Colorado Springs lifestyle with spectacular views and equally impressive apartments. Luxe finishes abound in each home, including nine-foot ceilings, quartz countertops and plank flooring. The gourmet kitchens have spacious breakfast bars and energy-efficient appliances, and select living rooms boast wood-burning fireplaces and private balcony access. Conveniences such as walk-in closets, attached garages and full-size washers and dryers are also included. 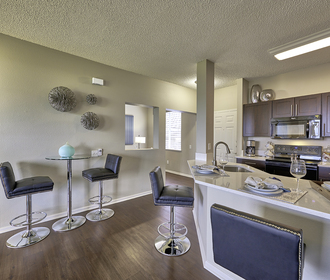 Outside, you will find several amenities that complement the first-class lifestyle found within each apartment. 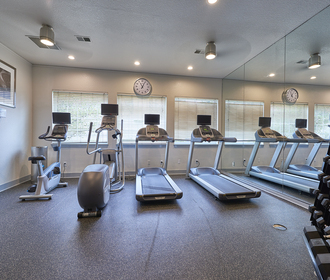 Stay active in the twenty-four-hour fitness center, lounge in the modern clubhouse or splash in the swimming pool as you take in the purple mountain majesty of Pikes Peak. Situated near Interstate 25 and Highway 21, this pet-friendly community features a peaceful setting alongside all the comforts of city living.